Ski&Tennis: Tamarine Tanasugarn: "I want to be top 100 again"
Thirty-seven years of age and still the smile of a newbie at her first event, Tamarine Tanasugarn has never lost her joy on the tennis courts, even during the difficult past seasons of injuries, and now she is planning to comeback as strong as ever. In 2008, at the age of 31 she amazed the world with one of her best seasons, capturing her first grand slam quarter finals’ appearance at Wimbledon, right after winning a title on the Dutch grass of Den Bosch beating the world number 1 Dinara Safina in the final. Six years later, she dropped out of the top 450 in the world, but she still enjoys every moment out there and she said not to be ready for calling a career. At the age of 37 and in a sport where girls are often breaking through in their teen years, she often plays against opponent that can potentially have half her age. But she takes even this detail with a relaxed and positive attitude. “When that happens, actually, I am, you know like, ‘wow! She’s young’,” she said with a warm smile. “But luckily I don’t really pay attention to the numbers of the age, because, you know, I like challenging with their styles, you know, cause every girl has a different style,. Having been for many years one of the few faces of Thai tennis, she is now enjoying the company of up and coming girls. “It’s good, you know, they are such amazing girls, both of them, like Noppawan (Lertchewakaarn) and Kumkhum,” she said. “They are very nice girls and we are in the same FedCup team together. They are great and they are fun, you know, and I’m kind of happy because during my time I was the only one, me and also Paradorn (Srichapan), one of each side, you know, women and men, so it was kinda like not fun to travel alone with none speaking the same language, from the same nation. 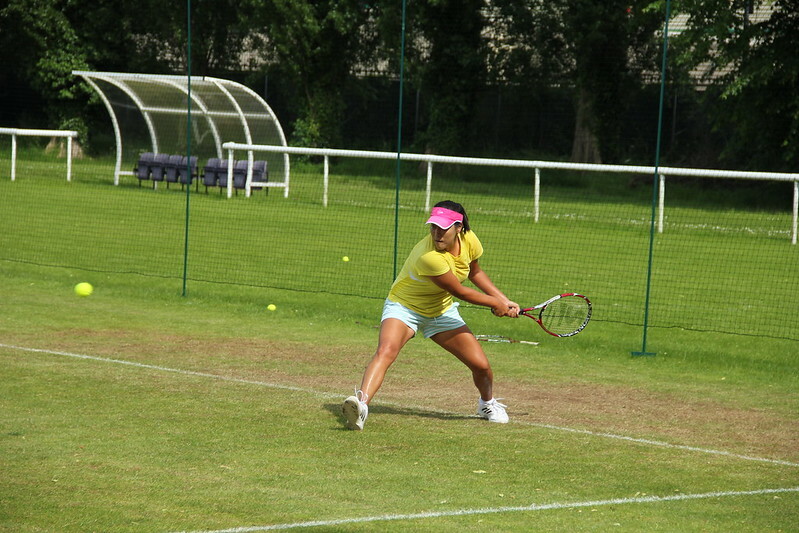 Tammy has been a very accomplished player on grass and fast courts in general, thanks to her flat strokes and low balls, she welcomed very positively the news that from 2015 the grass season will be one week longer. “Definitely it is very good to have a longer grass court season,” she admitted. “And I was like ‘well, I wished that it could have been earlier, when I was, you know, like in a good shape’. “But anyway, it’s very great for tennis cause we have longer clay courts’ season and longer hard courts’ season, so it should be longer on grass to be, how to say…equal. I know it’s kinda tough because French Open and Wimbledon are close, but it’s a good news, so, you know like, it’s a beginning to have one week longer grass season. It comes as no surprise then that her favorite tournament of the year happens at the end of these soon extended three weeks, in London. “I love that atmosphere because some places are just like, you know, ‘oh, big names’, so they go for the big names. This year she did not manage to enter the Wimbledon draw, but this is only a motivation to try harder for the next season. “For sure, you know, because at the end of last year I didn’t play much in singles, so I dropped my rank a bit, so my next challenge is, you know, to be back to the top100 again with my singles. It is an ambitious goal for her, when her best ranking, at number 19 in the world, arrived 12 years ago. But she is not afraid of trying.